Sands of Fortune Slots - Read the Review to WIN BIG! Indiana Jones, eat your heart out! Sands of Fortune Slots takes you on a wild adventure that shapes itself on the likes of Crocodile Dundee and Raiders of the Lost Ark. 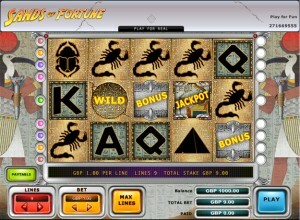 Sand of Fortune is a 5 reel, 9 pay line slot machine where the more lines you bet the higher your chances of a win. Sands of Fortune offers you the maximum bet of £3 multiplied by the number of lines you choose, therefore a maximum bet on any spin is £27. If you are interested in making a variation with the denominations of your bet, there is a minimum of 10p. Before you begin playing this game note the payable on the left-hand side of the screen which highlights the different combinations of a winning spin and its worth. Additionally, before playing Sands of Fortune slots you are invited to play online for free with with £1,000 to play. Unlike most of the other slot games, the Sands of Fortune slot doesn't have a multiplier symbol however this is compensated by a special bonus feature. Activate the bonus feature, depicted but a grey block with the word ‘bonus' written on it and watch the magic happen as the symbol animates into a doorway to a pyramid, giving you the opportunity to win more money or spins. There is also a wild symbol, which substitutes for other symbols to help you make a winning combination. The Sands of Fortune slot game is an exciting online slot machine that displays an array of captivating graphics, sounds and also includes animations on most of the symbols when they are spun or activated. The easily navigated play and betting buttons means you can concentrate on spinning to win.